Shipping and handling fee for private/ supply spree will be cheaper than normal spree rate as supply/ private you are buying in bulks of 10 items. Confirmation email will be sent to you, together with the invoice. Update me the transaction details once payment made. Confirmation of receipt will be sent to you and all updates will be shown on "Spree Status Post". Risk of out of stock will be lower. One-time payment and no further payments will be required after items arrived! Minimum capping of 10 items for all taiwan sprees. Not applicable for normal spree discount as it's already supply rate. If the 10 items have out of stock item, the supply rate will revised to normal spree rate. It's better to purchase more than 10 items. Stated in the order form. If per item is NT100 that mean 10 items total will be NT1000. Add in amp; if handling fee is S$3.50 per item that mean 10 items total will be S$35. 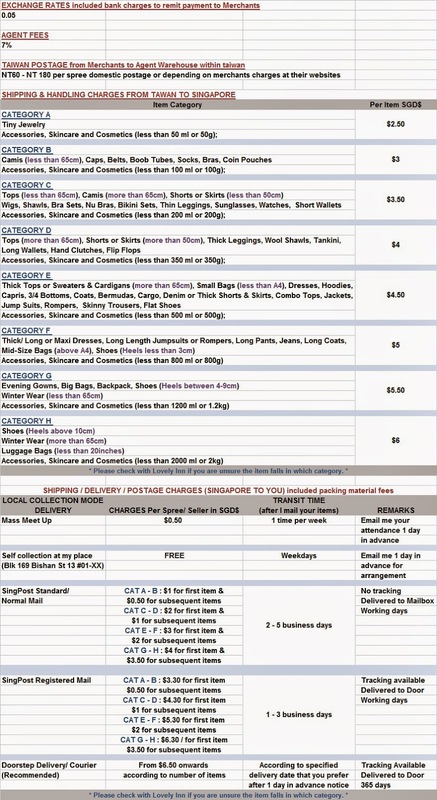 Free for self collection or add in any local delivery fees as above chart if any. I supply all the sprees that are shown at my blog or any spree that you suggest from taiwan.